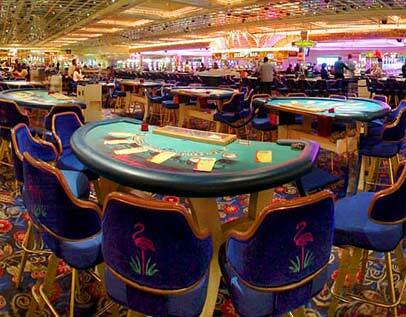 The Flamingo Hotel and Casino offers 6 incredible locations and many packages for weddings. Each wedding packages includes a professional wedding coordinators to help custom-tailor each detail. Once you know what you want, you can pick where you want it. Each one of the wedding locations have amazing scenery, whether it's in a traditional chapel, or outside in a lush, tropical setting. The indoor Garden Chapel has a combination of privacy and comfort along with the Gazebo Chapel and the outdoor WestLawn. The Garden Trellis is covered in rose trellis at a small garden and the ParadiseFalls is located in front of the Paradise Waterfall at the Flamingo. One of the most breathtaking of all the Crescenso Pool, here the unforgettable ceremony will have the bride enter from beneath a waterfall and walk down an asails between two pools. She will meet the groom at another 15-foot waterfall making it a tropical paradise. No matter what you pick, the Flamingo will be sure to make it a day that you and your guests will never forget. Flamingo � to be added.